The remarkable cellist will be the first-ever Artist in Residence for Octave 9: Raisbeck Music Center. Cellist Seth Parker Woods has made a career of challenging boundaries, appearing with artists ranging from Peter Gabriel, Sting, Lady Gaga and Adele to performing at institutions including Carnegie Hall, Tate Modern, Royal Albert Hall and New York City Ballet. Now his artistic adventure continues with the Seattle Symphony. Parker Woods will be the first-ever Artist in Residence for Octave 9: Raisbeck Music Center, the Symphony’s new venue for immersive musical experiences which will open next March at Benaroya Hall. In preparation, Parker Woods spent a week embedding himself into the Symphony’s community and education projects earlier this fall. As a boy in Houston, Parker Woods recalls growing up in a home filled with music. His father was a jazz and gospel singer and his mother is a fan of ballet and opera. He recalls sitting on her lap on Sunday afternoons, listening to his father’s band rehearse. That’s partly why he has brought a community-first approach to his residency with the Seattle Symphony. 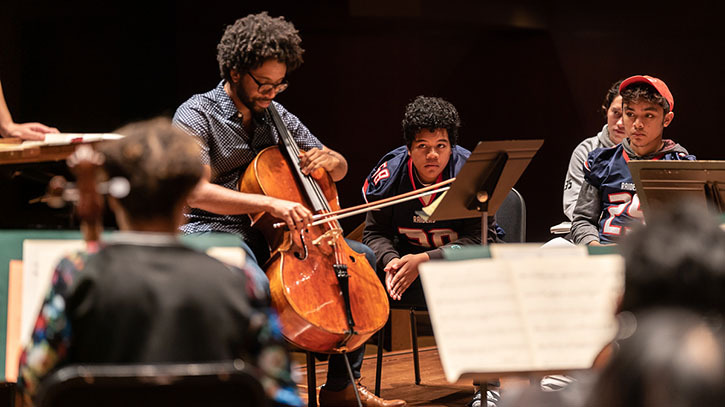 In October he performed two Community Concerts, hosted an Open Rehearsal and participated in a youth-led panel alongside fellow cellist Sheku Kanneh-Mason. “Giving concerts is only part of the job of a musician — you have to show up in other ways too,” says Parker Woods. Committed to redefining the image of a classically trained cellist in the 21th century, Parker Woods has made it his personal mission to affirm the importance of music being created today, commissioning and championing a wide spectrum of music. And he brings a contagious enthusiasm to how he talks about new music, inviting the audience to fall in the love with it. For the Community Concerts in Des Moines and Tukwila, he performed Rebecca Saunder’s Ire Concerto for Cello, Strings and Percussion with Associate Conductor Pablo Rus Broseta and a chamber ensemble of Seattle Symphony musicians. At the Open Rehearsal, students from Nathan Hale High School and Seattle World School joined Parker Woods and the Seattle Symphony on stage. Throughout the morning they interacted with the musicians and discussed the emotions of the music and how a composer translates an idea or feeling into notation on the page. Parker Woods will return for concerts in March after the grand opening of Octave 9 and will be Artist in Residence through the end of the 2019–2020 season. Although the cello is always at the center of his creative work, Parker Woods also draws from connections to choreography, visual art and theatre in his performances. His residency will take full advantage of Octave 9’s one-of-a-kind capabilities, including surround video projections, motion-capture cameras and a state-of-the-art Meyer Sound Constellation® Acoustic System. Plan your musical adventure in Octave 9: Raisbeck Music Center! Tickets are on sale now for concerts, talks and musical experiences for the entire family.